We love Ninja Forms – It’s an extremely powerful plugin that’s easy to implement. This tutorial will show you how to make it even more powerful by using Ninja Forms Webhooks to set Logic Hop Goals! Webhooks are a means to send data to another service. Simply put, once a form is successfully submitted, the Webhook sends data to a URL. Why Do I Need Webhooks? Logic Hop Goals allow you to track user events, like form submissions. Setting a Goal is easy when the form redirects to another page, but what if you don’t want to redirect the user after the form is submitted? Easy – Use Ninja Forms Webhooks to send the data in the background and set the Goal without leaving the page! Goal tracking gives you the ability to know exactly what users are doing on your site. Logic Hop gives you the power to use those Goals in conditions to display personalized content and much more. Imagine knowing if a user has completed your Consultation Request form – Now you can identify them when they return and personalize their experience. 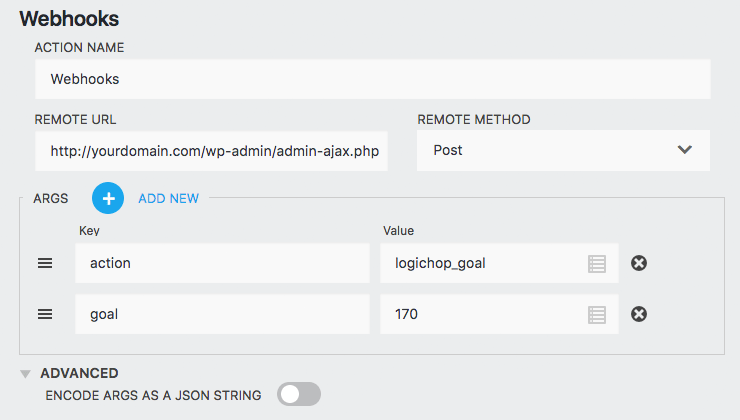 Logic Hop provides an AJAX method that allows you to set Goals from Webhooks and other third-party service. The following steps will walk you through connecting to it from Ninja Forms Webhooks. After your Goal is created, make sure to note the Goal ID. This can be found in the Shortcode field. The Goal ID in our example is 170. The Webhooks editor is located in Dashboard > Forms > Form > Emails & Actions. Your Remote URL will be prefixed with your domain name and followed by /wp-admin/admin-ajax.php. The Remote Method must be set to Post. That’s it! Now test your form submission and confirm the Goal is being set by viewing your Logic Hop Insights. Not working? Be sure you have the Remote URL set properly!